Back cover blurb: Joni, Trina, Deb and Eden. Best friends since the first day of school. Best friends, they liked to say, forever. But now they are in their thirties and real life - husbands, children, work - has got in the way. So, resurrecting their annual trip away, Joni has an idea, something to help them reconnect. Each woman will write an anonymous letter, sharing with their friends the things that are really going on in their lives. But as the confessions come tumbling out, Joni starts to feel the certainty of their decades-long friendships slip from her fingers. Anger. Accusations. Desires. Deceit. And then she finds another letter. One that was never supposed to be read. A fifth letter. Containing a secret so big that its writer had tried to destroy it. And now Joni is starting to wonder, did she ever really know her friends at all? 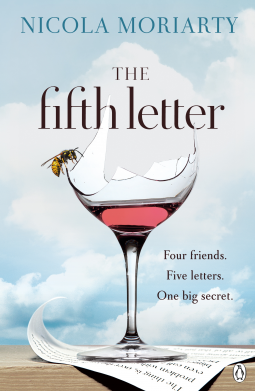 The Fifth Letter is the first Nicola Moriarty novel that I have read, I understand in fact that it is her debut, and a mighty fine debut it is. The Fifth Letter follows a group of four women, who've been friends since School. They holiday annually together and have remained great friends through great change; university/college, marriages, miscarriage, infertility etc. It is whilst on one of these annual trips that the group of friends decide to write the others an anonymous letter. There will be four letters, one from each of the individuals to the others in the group. A confession to something that no one else knows, despite their closeness. Something that they have hidden from the others for years. What starts of as a bit of a drunken joke, quickly becomes serious, and one of the four gets up in the middle of the night to destroy her original letter and write another. With good reason. Her original letter is vicious, poisonous even, towards another in the group. Realising her mistake, she vows to get rid of the first letter that she has written. But when you are with a group of friends so close, is it really possible to hide your darkest secrets from them? For a good while I was certain that I knew who had written the Fifth letter (turns out I was eventually right) but the author kept me guessing with a good few twists and turns before revealing it's author. The Fifth Letter is available via Amazon online and all good book shops.